Every year an artist or designer makes specially designed decorations for Maihaugen's Christmas tree. The artist is free to create his or her own expression. It is always exciting to see the result when the Christmas tree is lit. The first person to design his own decorations for Maihaugen’s Christmas tree was Per Spook in 2008, who decorated the tree with glass ornaments. 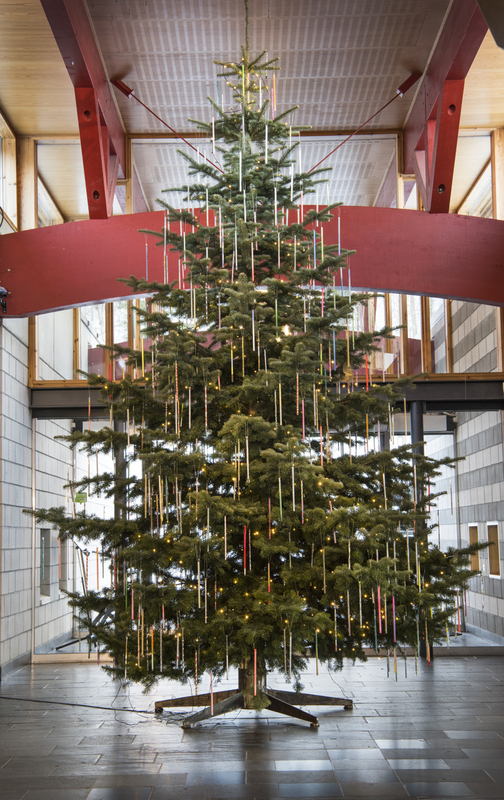 Since then, the tree has been filled with different art and designs from several of Norway's foremost artists and designers. The tree is lit in the Visitor Center at Maihaugen the last Friday before advent. The lighting of the tree is an event in itself every year. 2008: Per Spook. Glass ornaments. 2009: Pia Myrvold. Miniature plexiglass squlptures inspired by the northern lights. 2010: Arne & Carlos. Knitted Christmas baubles. 2011: Karen Bit Vejle. Paper cuttings. 2012: Gunnar Torvund. Houses in different materials. 2013: Hanne Borchgrevink and Tore Hansen. Different woodcut/veneer figures. 2014: Ingjerd Hanevold. Metal flowers made from recovered materials. 2015: Kari Mølstad. Hand blown glass decorations. 2016: Anderssen & Voll. 3d-printed plastic ornaments. 2017: The design- and architecture company Snøhetta. Glass tubes filled with different materials. 2018: Kjell Erik Killi-Olsen. 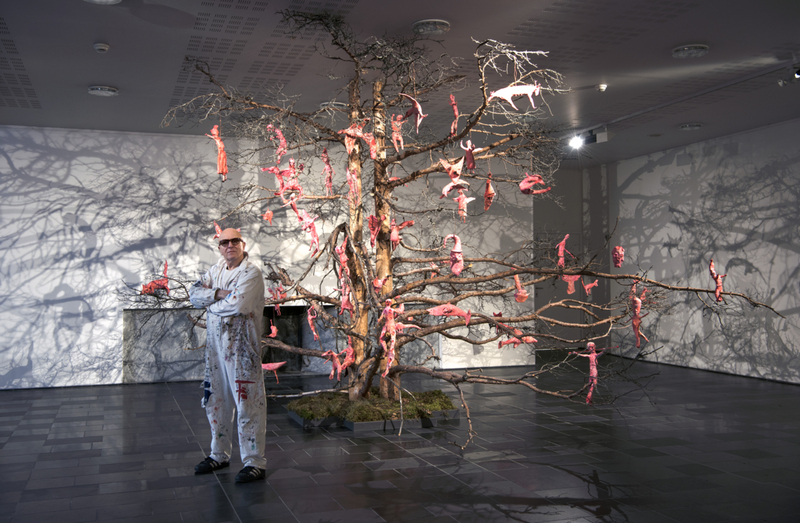 A dead pine tree decorated with red-pink figures in papier-mâché and wood pulp.